Delightful vintage walk up. Located one block east of Clark at the corner of Ashland and North Shore. A short walk from Loyola, public transportation and shopping, dining, entertainment. 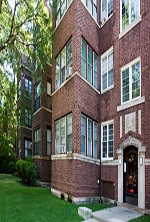 All apartments renovated on the inside while preserving the exterior vintage appeal. With affordable pricing, spacious units, and overall convenience, this is the perfect spot for any value-seeking Chicagoan to call home. Schedule Appointment and receive special offer!